5th Annual “More food. Less hunger.” Food Drive is Here! It’s that time of the year again! Our 5th Annual “More Food. 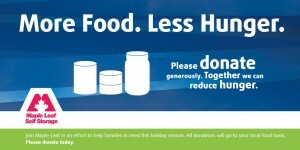 Less Hunger.” food drive starts December 1st. We’ll be collecting non-perishable food items until Monday, January 8th at each of our 14 self storage locations. As news channels such as Metro and Global reported, more people needed to use the food banks this year and the supply is at a historic low. It is crucial for the food banks to have a constant supply, especially during the winter months. This year our goal is to donate over 1000 lbs. of food to local food banks. Last year, 900 lbs. of food went to the Greater Vancouver Food Bank, SHARE Family & Community Food Bank in Port Moody and the Calgary Food Bank. Brown’s Moving and Storage has generously offered to pick up donations at our 10 B.C. locations. Sparta Movers will be completing deliveries for our four Calgary self storage locations. We greatly appreciate their generosity! Join the conversation on Twitter using #MoreFoodLessHunger. Follow us @StoreMapleLeaf. 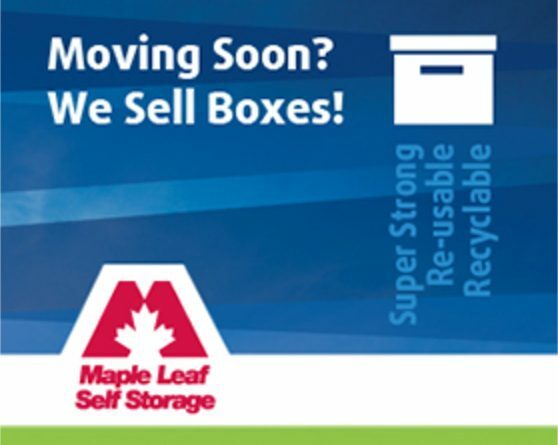 Maple Leaf Self Storage Coquitlam – Lougheed Hwy.